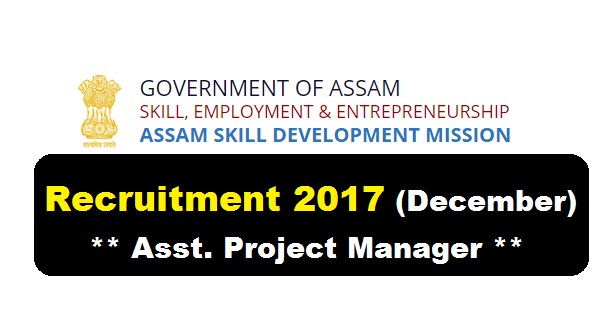 Assam Skill Development Mission Recruitment 2017 invites Applications in prescribed form published in the official website of Assam Skill Development Mission, Guwahati for engagement on contractual basis for the post of Assistant Skill Project Manager-Industries. Following are the details of the posts under Assam Skill Development Mission Recruitment 2017 [Dec] with post details, number of vacancies, age limit, salary, required qualification with application details. Educational Qualification: Candidates must have done BE/ BTech from any recognised university with minimum 5 years experience in relevant field. Interested and eligible Job seekers who are willing to apply must send their application in prescribed form to recruitment.asdm@gmail.com. The prescribed application form is available in the website of ASDM www.asdm.assam.gov.in . Application submitted other than the prescribed form will not be considered. Last date of submission of application is 15/12/2017 till midnight. The engagement will be on contractual basis. Based on performance and contract may further be extended. In addition to the fixed salary as mentioned above, selected candidate after joining will be entitled to get admissible allowances, benefits as per rules of the Assam Skill Development Mission. The benefits are subject to change, depending upon circumstances. The short listed candidates have to appear written test and interview. No TA/DA will be given for interview and written test purpose. Incomplete application shall be rejected without giving any information. reasons thereof. Decision of the Mission will be final and binding in this regards. For any other updates, the candidates are advised to visit this website regularly.